The internet, although makes our lives a hell lot more comfortable, is dark and full of terrors especially when it comes to privacy and security. Be it malicious hackers, your internet service provider (ISP), or even the government for that matter, is tracking all of your online activity. Given the situation, you need some cloaking mechanism of sorts to hide your internet activity. And that’s where you enter VPN. Virtual Private Network aka VPN encrypts all of your online activity thereby improving the security scene. There are other advantages to using it as well. For instance, since VPN providers maintain servers in different countries, users also get to unlock content which is otherwise blocked in their respective countries. There is a vast number of VPNs available for a majority of machines which include desktops, laptops, tablets and Android handsets. In this article, however, we will only be dealing with the VPNs related to Android devices. 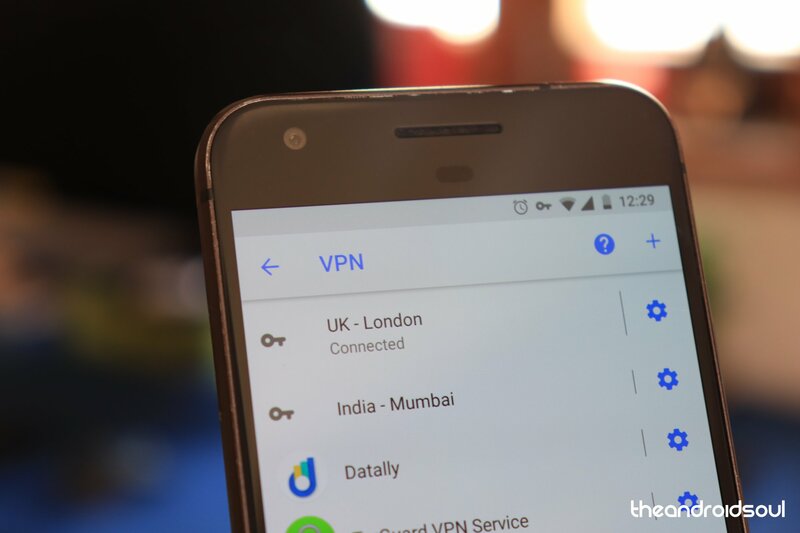 Okay, now that we have established what’s VPN and why you should be using it in the first place, let’s check out the best VPN services available for Android (in no particular order). 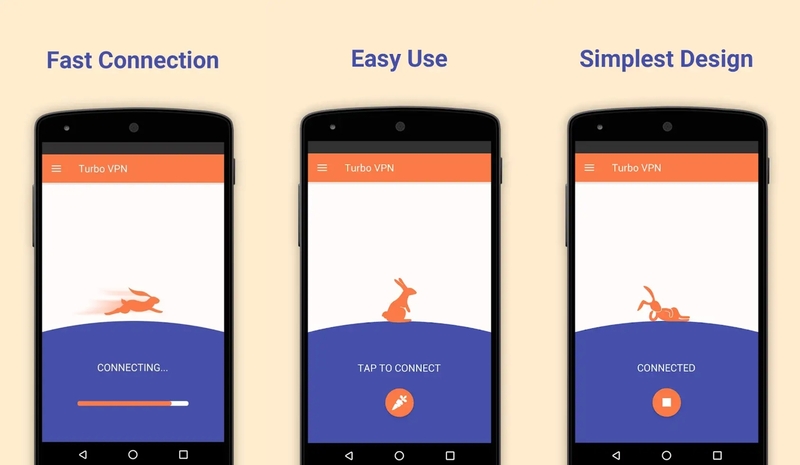 Turbo VPN is possibly the best VPN application available on the Play Store. The app offers unlimited usage even without paying for the premium VIP service which is still cheaper than most other premium VPN subscription applications. The UI for the app is fairly simple as well and easy to navigate about. Subscribing for the VIP service would remove all ads and would also increase the surfing and download speeds, however, if high speed isn’t a top priority, then we’d suggest sticking to the free version since there isn’t much of a drastic speed difference between the VIP service and the free version. Again, TunnelBear is another VPN service that comes with no logging policy which means more privacy! Also, TunnelBear VPN uses 256-bit encryption by default. So, that’s an added advantage. The app, while packing a fair amount of features, is quite simple and user-friendly. If you are new to VPN, you should consider using TunnelBear to get started. Speaking of which, TunnelBear offers you 500MB of bandwidth for every month with the free version. 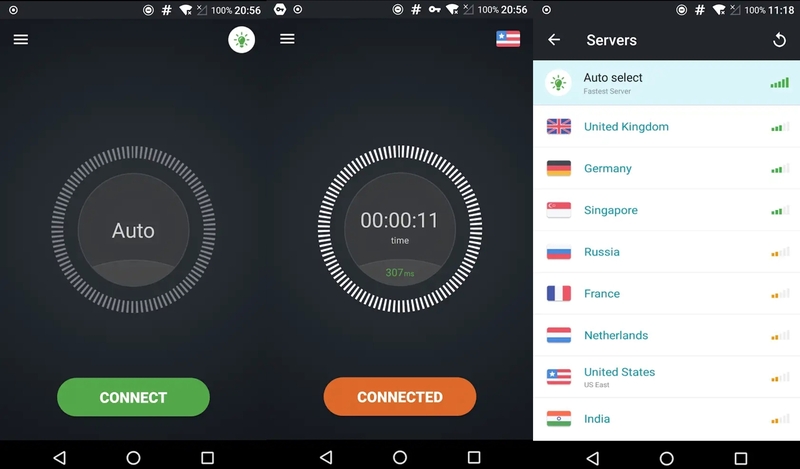 Windscribe VPN is much like any other VPN service, however, while testing out the application we noticed the app offers slightly better speeds than most other VPN applications even while using the free version. The app offers 10GB data per month for free which is more than enough if you aren’t downloading gigs of data at a time while using the VPN. One of the most important aspects to look for while choosing a VPN service is to check their logging policy. And boy, NordVPN got it all covered. The company has a strict no logs policy thereby offering some serious privacy. “NordVPN never logs what you do and where you go on the Internet. So if anyone asks, the best we can do is shrug our shoulders. And we like it that way,” reads its website. It provides 2000+ worldwide server locations in over 60 different countries and offers military-grade-encryption as well. You can connect up to 6 devices with a single license which is a welcome feature if you have a bunch of gizmos at your disposal. 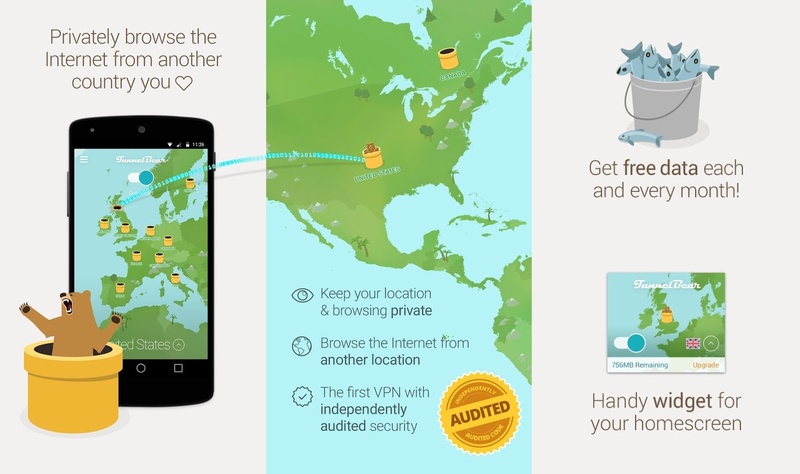 Snap VPN has great reviews on the Google Play Store and is definitely one of the better VPN applications. The application is in some ways similar to Turbo VPN with a few exceptions. Snap VPN too offers absolutely free VPN services with unlimited bandwidth and high-speed connections. What’s even better is that you don’t have to go through the headache of registering to use the application. Simply install Snap VPN and get started. If you are a newbie to VPN, you should check out the Yoga VPN which btw is available only as an Android app unlike most of the other services mentioned above. Getting started is relatively simple, just download the app, select the country, and you’re connected! The app requires no logins or sign-ups as such. Yoga VPN promises to never record your online activity alongside offering features such as unlimited time, unlimited speed, and more. On top of all of that, it’s100% free. ExpressVPN is one of the well-respected brands when it comes to the VPN industry. It boasts an excellent customer service support and offers all the top-notch features that you’d expect from a sophisticated VPN service including advanced encryption, unlimited bandwidth, and strict no logging policy. Moreover, the company has over 145 connection locations in 94 countries leaving you with plenty of options to choose from. However, ExpressVPN is a bit on the expensive side of the spectrum. That’s the only downside. 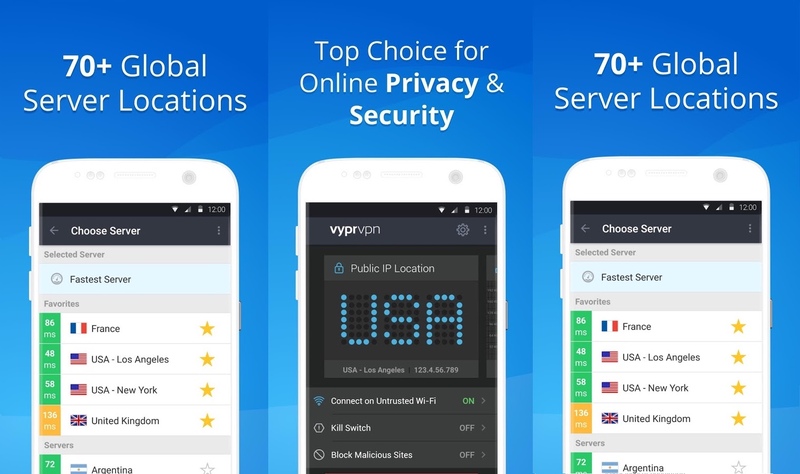 Apart from the fact that the VyprVPN app keeps track of your online activity (partially) in the form of IP addresses, connection times, and the like, there’s no reason for you not to consider using the service provided by Golden Frog, a Switzerland-based company. It has it’s own networks, meaning no dependency on third parties, and offers a well-optimized app. It’s fast, easy to use, and provides over 70+ global server locations. 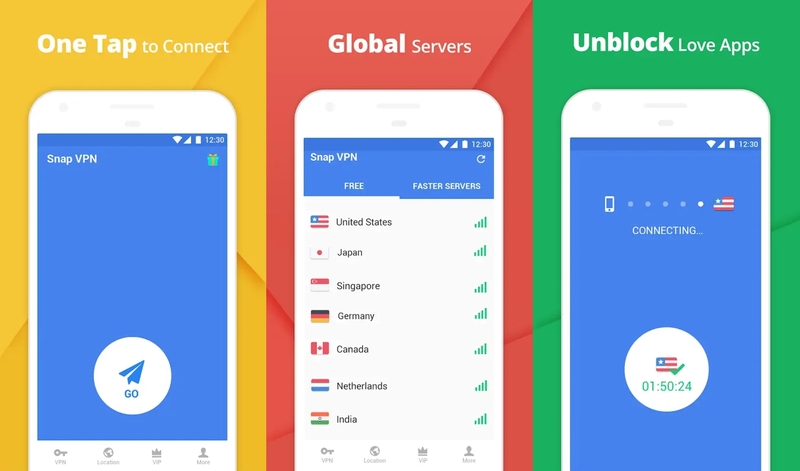 Surf VPN too offers the basics of any VPN application and most importantly the free version does not have any monthly data cap like some other VPN applications on the Play Store. The application also promises to be ‘ultra-secure’ hence, you should not worry much about data theft. Surf VPN offers servers in several different regions all across the globe so you won’t be stuck to a few servers. 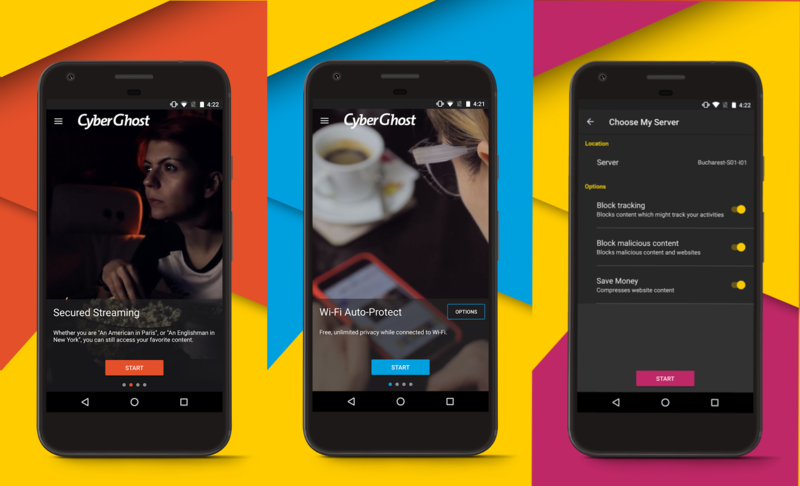 CyberGhost is yet another VPN service which does what it’s supposed to do, i.e., protect your online activity reasonably well. It’s affordable, fast, and reliable. Plus, it allows you to torrent anonymously just in case if you were looking for it. Other features like Wi-Fi protection, advanced encryption, unblocking censored content are also there. 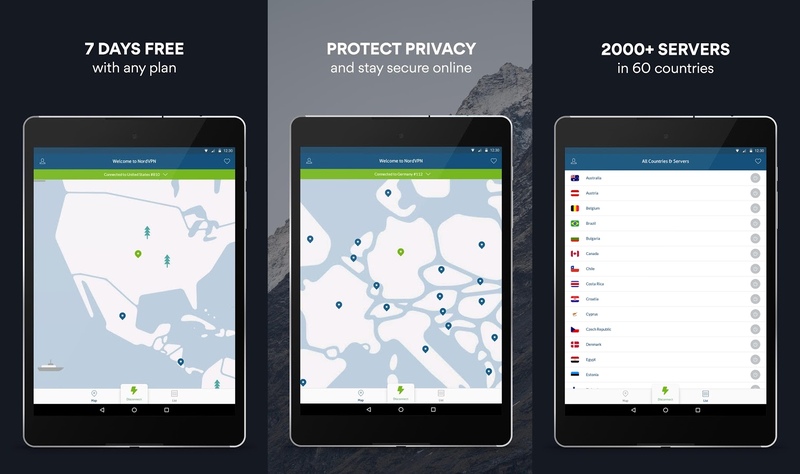 Like any other VPN service out there, Freedome VPN by the Finnish provider F-Secure, promises to offer security and privacy to your browser activities. 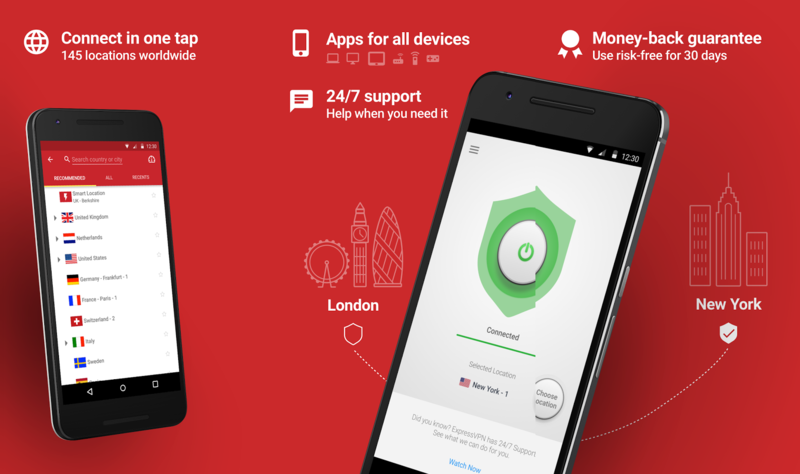 Akin to Opera VPN, Freedome also blocks ad trackers to help improve your web surfing experience. As for the design, the app’s single button interface is pretty neat, and a few taps should be more than enough to get you started. The best part about Freedome VPN is that it requires no registrations or logins. 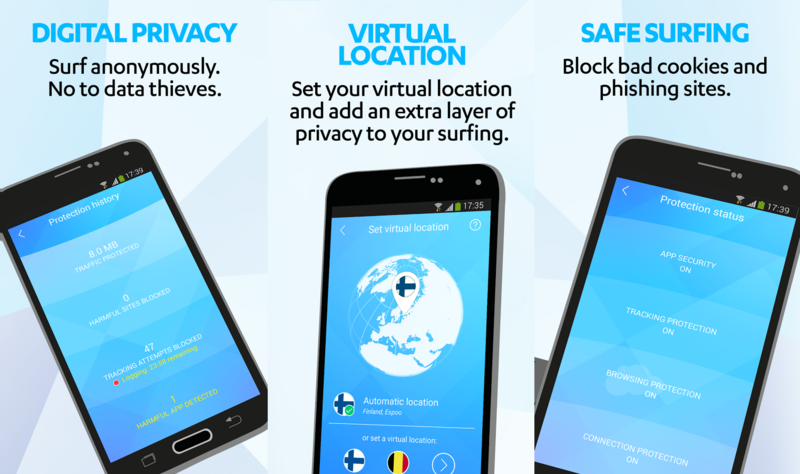 Secure VPN is another basic VPN application which does exactly what it’s supposed to do. The application also lets you choose which apps you want to use the VPN with and which apps you want to use normally. While the features in the application are basic, at least they work well and do what’s expected from a VPN application, which is to let you surf the web in peace and visit any website you want while keeping your information safe as well. There’s no data usage limit or time limit even when using the free version. 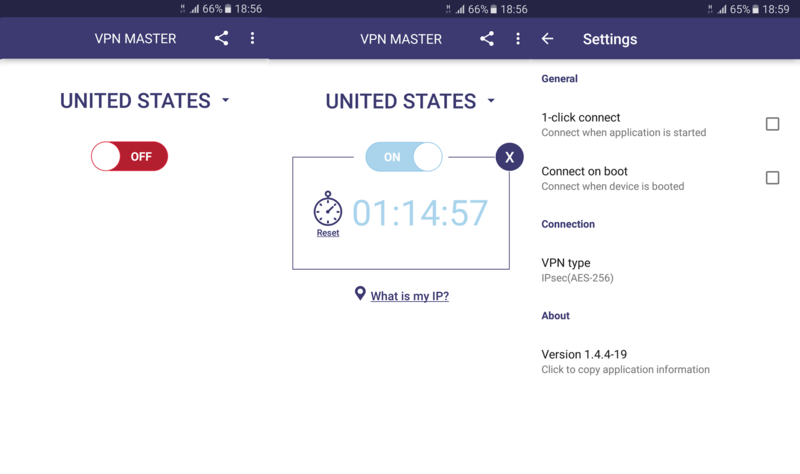 VPN Master is one of the highly rated VPN apps in the Play Store which claims to provide “Premium paid-up VPN service for ABSOLUTELY FREE!” It touts a friendly and easy-to-use interface with a one-touch connection, unlimited bandwidth, speedy service, and torrent support if that’s what you are looking for. Also, it has servers in 20+ locations to connect to. The app comes with a great minimal design without many intrusive buttons and menus. Simply select the server region to which you want to connect to and then within a few moments the VPN would be up and running. VPN Lighter is one of the only few applications which is 100% free without having any premium service too. All data would be encrypted as well as every other VPN application to ensure your data is secure. 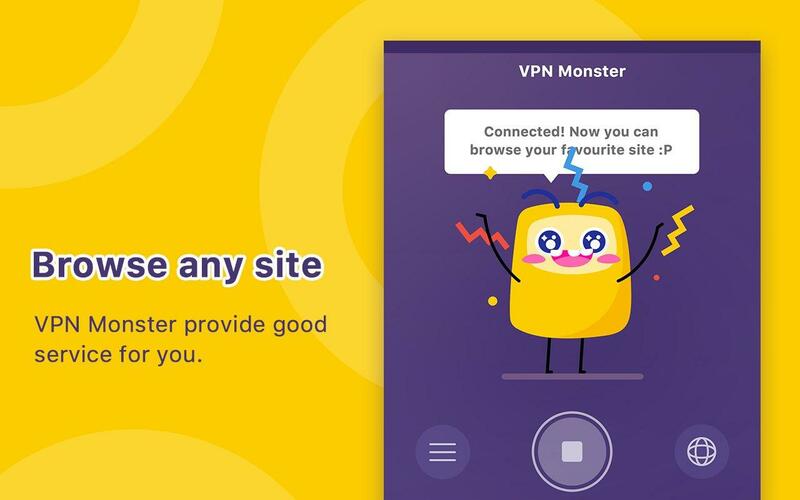 The VPN Monster app works reasonably well over Wi-Fi, 4G, and 3G and offers unlimited bandwidth to its users. 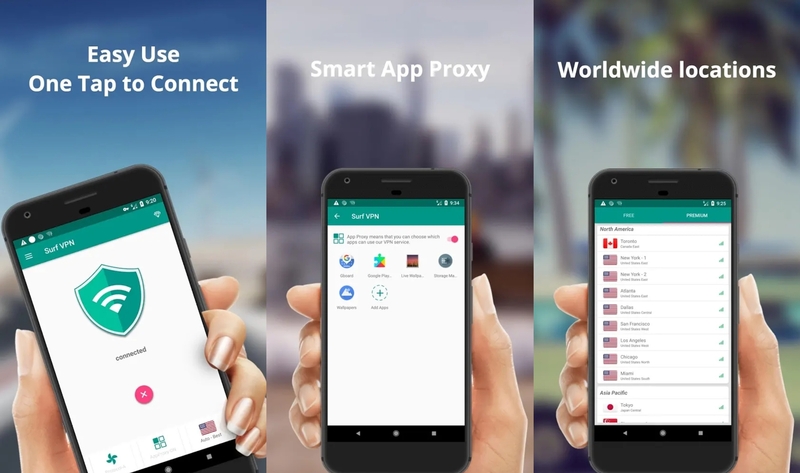 The app lets you connect to different servers located in various countries including UK, Holland, Germany, Singapore, Canada, US, India, and more. Setting up the service is also pretty straightforward and wouldn’t take much time connecting to a server either. Ads, at times, can be overbearing but you’ll have to live with it if you are planning to use the free version.